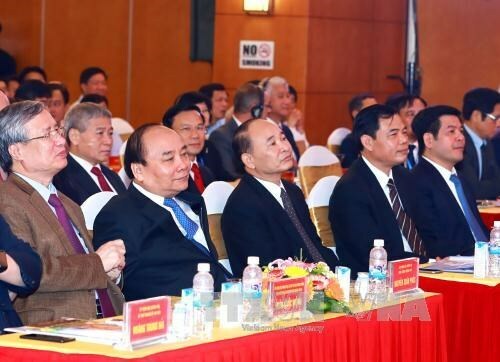 Thai Binh (VNA) – Prime Minister Nguyen Xuan Phuc emphasised the need for the northern province of Thai Binh to become a pioneer in getting rich from a smart, organic and clean agriculture while attending a conference to promote investment in the locality’s agriculture on April 8. In Thai Binh and other localities where the state economy accounts for a big proportion, from now, business should be a main force in building a new-style agriculture and creating a farm produce market that meets consumers’ demand, Phuc said. To gain success in agricultural development, it is also necessary to strengthen cooperation between the State, investors, farmers, scientists and banks, he added. The Prime Minister requested the province to be brave to transform food security into nutrition security, which contains not only food and food stuffs but also vitamins. He suggested Thai Binh focus on developing aquatic farming and catching as well as reform public investment and services so as to encourage the involvement of more businesses and investors in agricultural development. It was required to boost human resources training, intensify technology application and attract more excellent agricultural professionals to the locality. The Government leader also asked the province to invest more in building an agricultural trademark and bettering distribution systems. He expressed his hope that enterprises and investors will have long-term and comprehensive strategies on the value chain from production to processing. With 105,755 hectares of agricultural land and more than 1 million labourers, Thai Binh has become an attractive destination for investors in the agricultural sector. Speaking at the conference, Chairman of the provincial People’s Committee Nguyen Hong Dien affirmed that the local authorities always consider enterprises a driving force for the local economic development and pledge to facilitate their operations. At the conference – the biggest-ever held in Thai Binh, the province presented licences to 11 investment projects worth 2,016 billion VND (87.65 million USD), while giving approval to investors to conduct research on 19 projects worth 20,925 billion VND (909.7 million USD) specialised in hi-tech agricultural products and aquaculture, and giving investment certificates to three projects on the construction of roads in the build-transfer and build-operate-transfer model with combined registered capital of 2,717 billion VND (118.1 million USD). On the same day, PM Nguyen Xuan Phuc visited the Thai Binh 1 Thermoelectric Power Plant in Tien Hai district.